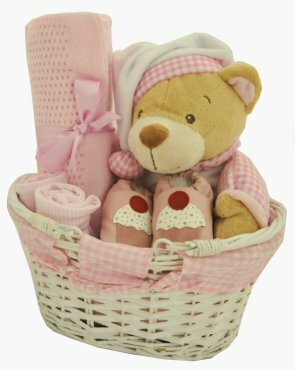 This gift basket contains a series of lovely surprises for both parents and baby. The soft cuddly 25cm Goodnight bear is suitable for new born babies with its soft delicate embroidery and cute pajamas. Also included is beautiful designer pair of handmade leather Shoes that will definitely remain a keepsake item in years to come. The shoes are recommended by health professionals and a non-constricting shape, non-slip soles and gently elasticated ankles for easy to put on and stay on. In addition, the basket contains a beautifully embroidered 100% cotton sleep suit suitable for 3-6m babies and a super soft embroidered pram blanket. These lovely items are displayed beautifully in a coordinating white basket with gingham lining and carefully protected with cellophane with hand tied decorative satin ribbons. This gift also includes your personalized message in a stunning handmade gift card.